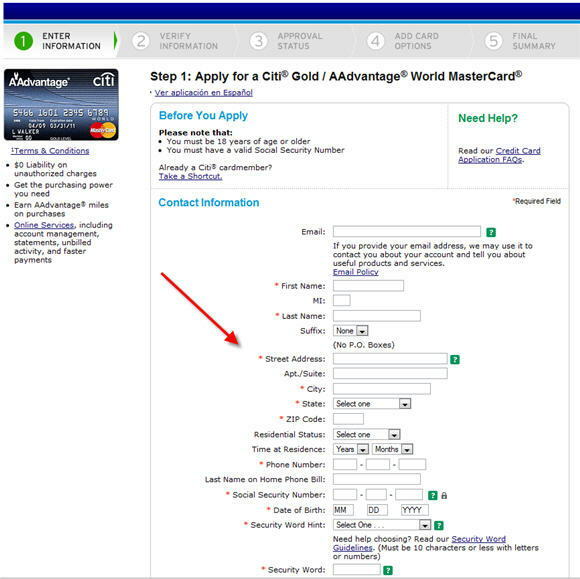 Summary - The CitiÂ® Gold/AAdvantageÂ® World MasterCardÂ® is the lowest tier among the American Airlines credit card issued by Citi. Should you get this card? Well, let's find out. Reward Formula - The CitiÂ® Gold / AAdvantageÂ® World MasterCardÂ® allows the cardholder to earn one AAdvantageÂ® mile for every dollar you spend on purchases on the card. As a sign-in bonus, new cardholders get 30,000 miles after $750 of spending during the first 4 months. You can earn up to 60,000 miles in one calendar year, but Executive Platinum, Platinum and Gold members can earn unlimited miles. Gold cardholders also get 5,000 reduced mileage award once a year whereby you can redeem an award with 5,000 less points. Annual Fee and APR - The annual fee is $50. Concierge Service - Cardmembers get a concierge service with this card and are very likely to use them as their travel agents when booking flights and hotels. Discount from Herts - Another privilege of having this card is that you can also get a discount from Hertz off their published rates. No preset spending limits - This feature used to be the realm of charge cards. But it looks at though Citi has joined the bandwagen and now offer this feature for this card. Trip Cancellation and Trip Interruption Insurance - Booking tickets with this card comes with a $1,500 trip cancellation insurance. This is a nice feature to have as many other issuers do not have this feature. Other Common Features - Other common features include travel and auto insurance, extended warranty, purchase price protection and lost luggage. Photo On Your Card - This feature is unique with Citi. You can have a photo of yourself on the card so that it makes it harder for folks to use your card in a store if it ever gets stolen. Citi has another version of this card, the Platinum Select version. The Platinum version has a higher annual fee at $85. Non elite members can earn up to 100,000 miles versus 60,000 for the Gold. The reduced mileage award is also higher for the Platinum Select version at 7,500 versus 5,000 for the Gold. The Platinum version allows you to earn double miles on AA airline ticket purchases, unlike the Gold version which only allows you to earn one mile for every dollar that you spend on the card. Citi Gold AAdvantage - The Best Card For AA? Verdict - Until just recently CitiÂ® Gold / AAdvantageÂ® World MasterCardÂ® was similar to the Platinum version in that both versions do not allow you to earn double miles. But the Platinum version has just been revamped and it now allows you to earn double miles and right now, you also get a great sign up bonus of 40,000 miles if you meet certain spending criteria. Hence, if you are looking for a Citi AA card, I would recommend the CitiÂ® Platinum Select/AAdvantageÂ® World MasterCardÂ® instead. Application Page - This is how the application page look like. You can check the terms again. Clicking the apply now button will take you to the page where you can fill in your details.